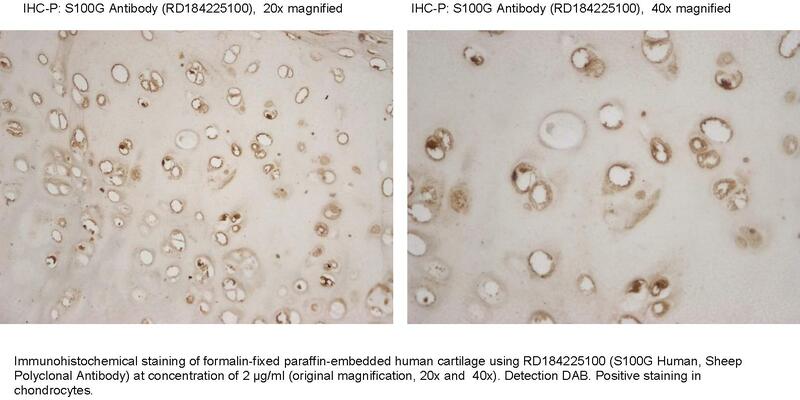 The antibody was raised in sheep by immunization with the recombinant Human S100G. The immunization antigen (10.04 kDa) is a protein containing 87 AA of recombinant Human S100G. N-Terminal His-tag, 9 extra AA (highlighted). Immunoaffinity chromatography on a column with immobilized recombinant Human S100G. S100G (S100 calcium binding protein G, Calbindin 3 (CALB3), CaBP9K, CABP1) is a member of the S100 family of calcium-binding proteins. The gene encoding human S100G is located on the X-chromosome (Xq22) and consists of three exons and contains four Alu repeats. The S100G protein (molecular weight 9 kDa) is monomeric and contains two Ca2+ binding motifs, a classical C-terminal EF-hand with a canonical Ca2+ binding loop and an S100-specific N-terminal EF-hand with a modified Ca2+ binding loop called ‘‘pseudo EF-hand’’. S100G protein is present in many organs, cartilage, bone and certain teeth, such as the ameloblasts of incisors and molars. In addition, S100G mRNA is detected in the proximal small intestine, but not in human kidney, uterus or placenta (however, the protein is present in these tissues in other species). S100G is also present in mammalian intestinal epithelial cells (enterocytes). S100G mediates the transport of calcium across the enterocytes from the apical side, where entry is regulated by the calcium channel TRPV6, to the basolateral side, where calcium pumps such as PMCA1 utilize intracellular adenosine triphosphate to pump calcium into the blood. The transport of calcium across the enterocyte cytoplasm appears to be rate-limiting for calcium absorption in the intestine; the presence of calbindin increases the amount of calcium crossing the cell without raising the free concentration. Expression of S100G, like that of calbindin-D28k, is stimulated by the active vitamin D metabolite, calcitriol although the precise mechanisms are still controversial. In mice that lack the receptor for vitamin D, S100G is reduced, but not absent. The members of the S100 family are multifunctional signaling proteins that influence with many cellular events. S100G appear to be involved in neurotrophic and/or neuroprotective processes, but the mechanisms of action are not completely understood. S100G has protective neurotrophic effects during brain development, and alterations in level may serve as an early, quantitative indicator of fetal brain damage in some biological fluids (eg, cord blood). Calcium-regulatory molecule S100G is dynamically expressed and regulated in the uterine endometrium during pregnancy and suggesting that regulation of calcium ion concentration may be critical for the establishment and maintenance of pregnancy in pigs.